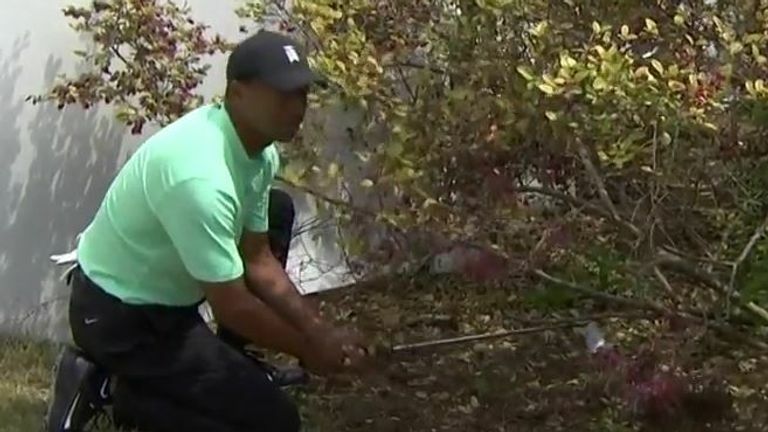 Tiger Woods plays a stunning recovery shot left-handed from under a bush in the WGC Match Play..
Tiger Woods has played some miraculous shots in his time. But from under a bush? Playing left-handed? On his hands and knees? Saying Woods was in a spot of bother would be a huge understatement and he was struggling on the 10th in the WGC Match Play against Brandt Snedeker. With his ball stuck a under bush at the Austin Country Club in Texas, there was only one thing to do. On his hands and knees, crouching down and playing the shot left-handed. Not only did the ball pop out, but it ended up just a few feet from the hole. Tiger sunk the putt and halved the hole with Snedeker. Click on the video above to see Tiger's incredible bush antics! Watch the WGC-Dell Technologies Match Play throughout the week live on Sky Sports. Live coverage continues on Friday with Featured Groups from 2.15pm.